In the global market for diamond like carbon (DLC) the manufactures are making constant efforts to attain competitive advantage by implementing highly advanced technology, as analyzed by Transparency Market Research (TMR). The manufactures are also introducing new products in the market and putting emphasis on brand promotion. Merges and acquisitions will also change the DLC market scenario. 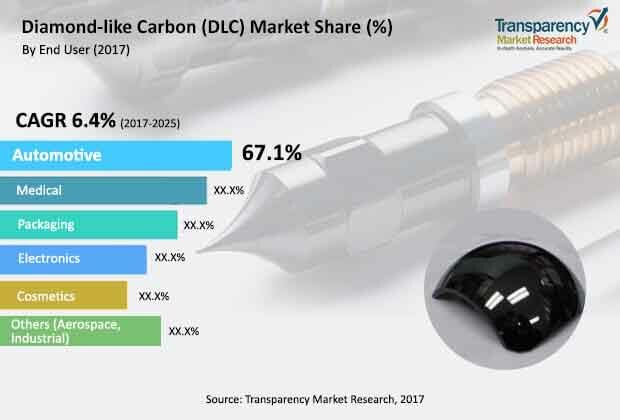 Moreover, the DLC market is expected to develop with the growth in the automotive industry, also increasing demand for high temperature coatings is providing huge opportunities for the DLC manufactures. The report describe about some of the key players in the diamond like carbon market, which includes IBC Coatings Technologies, Oerlikon Groups, Inc., Richter Precision Inc., Norseld Pty Ltd, Morgan Advanced Materials Plc, Wallwork Heat Treatment Ltd, Renishaw Advanced Materials Ltd, and Micromatter Technologies Inc.
As per the TMR report, the diamond like carbon market is expected to attain a stable CAGR of 6.4% during the forecast period starting from 2017 to 2025. The DLC market is also estimated to its valuation that US$ 1.38 bn in 2016. The in the end-users category, automotive segment is estimated to lead the DLC market across various countries. Major reason for this growth is mainly that the DLC reduces the frictional loss during high stress contact and in high temperature operations. These factors are benefitting the automobile industry and have drawn attention of automobile manufactures. Geographically, Europe is leading the global DLC market with highest number of shares. Higher growth of medical, automobile, and packaging industries with supportive government regulation have made the region at the leading position. The demand for hydrogen-free DLC is largely used by number of end-use industries due to its rigidity and wear resistance when compared to DLC that is combined with hydrogen. In the automotive sector hydrogen-free, DLC coating combines appropriately with the engine oil, which results in forming strong ultra-thin film when special oil additives are applied. Low friction factor and advanced abrasion resistance are increasing the demand for the DLC market. Manufactures in biomedical and automotive industry are aiming to use hydrogen-free DLC for effective working. Additionally, innovative technologies such as pulsed laser deposition and plasma enhanced CVD are expected to trigger the market for DLC. On the other hand, the DLC market can be restricted due to the limited coating thickness, which is either five µm or less. As the residual stress on the film, keeps on fluctuating it can create a delamination failure during high film stress. Moreover, during the low temperature that will degenerate DLC to graphite that can further limit the market from growing. As the properties of diamond and graphite are not same, thus coating will not affect in gaining the desired properties. Furthermore, in recent years the use of DLC films has intensified in larger production of mechanical components together with medical components. Therefore, this can be taken as the major factors driving the demand for diamond like carbon market globally.